Part of Germany-based Bragi’s story has always been that it was one of the first to market with a truly wireless, cord-free earbud, The Dash. That product didn’t receive glowing reviews over the last year, but when the company announced a less expensive and refined version with The Headphone, it looked like it could be a true competitor to Apple’s wireless AirPods. But the AirPods officially launched last week and are arriving to customers this week, and now Bragi is announcing a delay to its product that was supposed to ship for the earliest pre-order customers in time for Christmas. The product’s estimated shipping date was later pushed back to early January, but it looks like Bragi will miss that date for some pre-orders as well. Unfortunately, this email is not the Christmas message we wanted to send… The Headphone did start its shipping journey from Asia last week. The first Headphones are on their way, but not enough to fulfill all pre-orders… All of us at Bragi were excited by this milestone, but incredibly disappointed that we couldn’t fulfill all orders. To make up for the delay, Bragi is offering an extension of 30 days for the sales return warranty for pre-orders made in 2016. 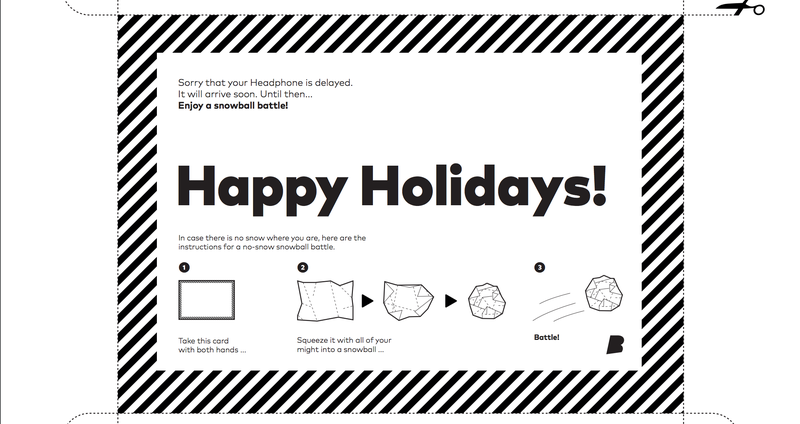 As consolation, the company also put together a PDF that you can print out and leave under the tree if you want your friends and family to hate you. In our review, we actually found The Headphone to be a decent cord-free earbud experience and one of the best yet prior to the AirPods launch. It’s harder to recommend them now that AirPods are out at almost the same price point with overall a more solid experience (in-depth comparison coming soon). While Apple finally launched its AirPods last week following delays from a launch originally planned for late October, it also delayed its new BeatsX wireless earphones into February. A specific reason for the delay wasn’t given, but it’s possible it could be related to supplies of the Apple-designed W1 chip for fast pairing, switching, and maintaining a reliable connection that both the BeatsX and AirPods use. As of writing, Bragi’s website still lists “early January” for orders placed as of December 1st, but doesn’t otherwise specify when new orders will be shipped out. The company’s memo to customers says it should be able to fulfill all orders in 6 days once it works out kinks in manufacturing, but it doesn’t estimate how long that might take.